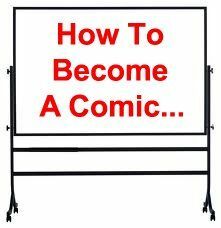 For those who are looking for information on how to be a comic, it’s a fairly straightforward process. 1. Locate places to perform. Development as a stand-up comic is dependent upon live audience performances. The vast majority of comedians start out performing at comedy club open mic nights. The number of performing opportunities on a weekly or monthly basis for a new comic can vary widely depending upon where they live. Individuals who desire to develop and deliver an “adult” stand-up comedy act are pretty much restricted to the comedy club arena. Individuals who have the ability to develop and deliver clean stand-up comedy material potentially have many more performing opportunities outside the comedy club market as well as at open mic nights. 2. Develop a 3-5 Minute act. Usually comics are afforded 3-5 minutes of stage time when they first start at open mic nights. It will be during these 3-5 minute performances that a comedian will develop their initial core stand-up comedy material that provides the foundation for developing additional material. 3. Progressing as a stand-up comic. Once a comic has a 3-5 minute stand-up comedy routine that consistently generates audience laughs, their next order of business is to move forward and develop 10-15 solid minutes of stand-up comedy material. When this happens, a comic is in a position to obtain opening act spots. Moving forward to the feature act, then headliner spots is a matter of simply having enough material that kills for each spot, along with developing a reputation for being able to perform at a high level with consistency. While it takes time to develop a reputation, the speed at which a comic can progress is directly related to the speed at which they are able to develop and deliver a stand-up comedy that rocks audiences. Note: If you are new to stand-up comedy and would like a detailed, “insider” view of the world of stand-up comedy, I highly recommend that you get your hands on a book called Comic Lives by Betsy Borns. This awesome book details the humble beginnings, challenges and successes of many of the “household name” comics you know today. What I have presented here may seem somewhat simplistic, don’t be fooled. It takes talent, dedication, persistence, experience and knowledge to be able to entertain audiences at a high level — a level that will lead to more and more performing opportunities. So if you wanted to know how to be a comic, those are the basics in a nutshell. This entry was posted in Stand-up Comedy Tips Archive and tagged comedian, comedians, comedy act, comedy club, comedy routine, open mic nights, opening act, stage time, stand up comedy, stand up comic by Steve Roye. Bookmark the permalink. Very clear and concise description of how to begin. I like your suggestion of polishing the initial tiny bits and waiting to build your material. For the beginner, it’s tempting (and potentially discouraging!) to work hard at developing a 30-or-so-minute routine before hitting the stage — only to find out there is nowhere to use such a long and unpolished act. You certainly present a clear and logical plan in this article. Thanks! No you are not doing this wrong! The speed at which a comedian can progress is dependent not only on their ability to develop stand-up comedy material, but to get the performances needed to sharpen and hone that comedy material in front of live audiences. Hopefully, you are engaged in performance improvement activities after every show so you can squeeze out the most benefit of each and every performance. what exactly would be considered “PERFORMANCE IMPROVEMENT ACTIVITIES” would that be improv classes etc ? Improv classes are NOT performance improvement activities for stand-up comedy. Here is a YouTube video that you might want to check out: http://youtu.be/2ncnifKxPiI (part 1) that should give you a better idea about what performance improvement is all about (I would recommend that you check out ALL those videos with Dave Arena if you are serious about progressing rapidly as a comedian). I will also say this – the ability to conduct intelligent performance review on videos of your stand-up comedy sets is one of the critical factors that can make the difference in killing audiences in years or in months. How soon would you suggest moving to new cities? Is it ok to do the same routine at different clubs if I don’t repat an act at the same club? Or do you think it’s ok to use material until it’s dried up? I commented on a similar topic to another poster, but I’m not sure MY advice was the best. Is there a rule of thumb for how long to use material and when to break out new stuff if you have new material ready to go? You need to have a solid act before moving anywhere. Yes, you can do the same act at different clubs. If your comedy material is timeless, you can use it for years. You break out new material as it is developed and you are ready to replace other comedy material you have.